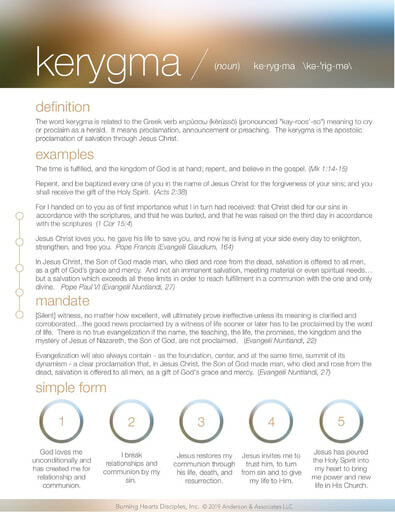 pdf What Is the Kerygma? Definition: The word kerygma is related to the Greek verb κηρύσσω (kērússō) (pronounced "kay-roos'-so") meaning to cry or proclaim as a herald. It means proclamation, announcement or preaching. The kerygma is the apostolic proclamation of salvation through Jesus Christ. This two page download includes examples of kerygmatic proclamation from Scripture, Church teaching, saints, and Popes as well as a simple form proclamation and reflection questions to help you enter into this core gospel message for yourself. For more information on resources that can help proclaim the kerygma, click here.